To be able to view Nigeria's future, Navigate reviews and analyses the trends that have been occurring in Nigeria in the political, social and economic spheres since the 1960s. From these, some of the most uncertain and highly impactful drivers of Nigeria's future are highlighted presenting four likely futures that Nigerians would have encountered by 2030. Imagine that you could actually predict the economic recession that hit Nigeria in 2016. Most especially the downfall of the naira against other currencies. Perhaps, you would have protected your financial interests and kept your money in more stable deposits that will enable you to ride the wave of the economic crisis without your financial situation worsening. Perhaps you would have delayed some of your transactions while hastening others. 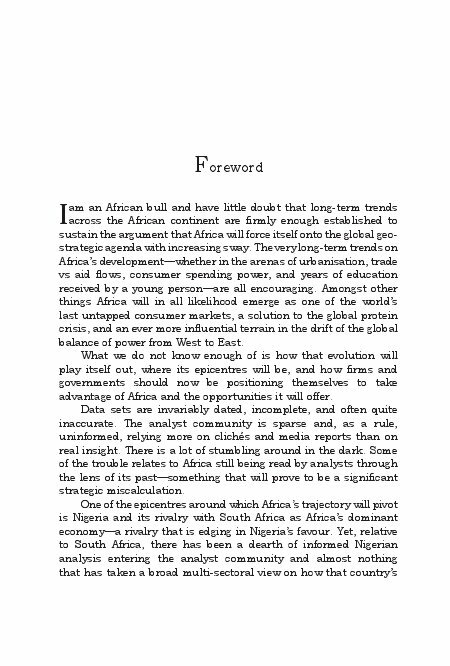 To make this clearer, let us assume this is January 1965, just a few years after Nigeria gained independence and a year before the country descended into a bloody civil war. Let us assume you, an Igbo man was deciding whether to open a new branch of your booming company in Northern Nigeria and in another Eastern State. You consider numerous factors, but you clearly could not see the war coming. Because of this, situating your new branch in a new region looked very lucrative as you could claim the opportunities in a new market. You began to see signs that a conflict might be brewing only a few months later. However, at this time, you had already made a significant investment that meant running home would amount to counting your losses. There are many reasons we all want to see how our future unfolds. Sometimes it is to pre-empt it, other times to prepare for it. 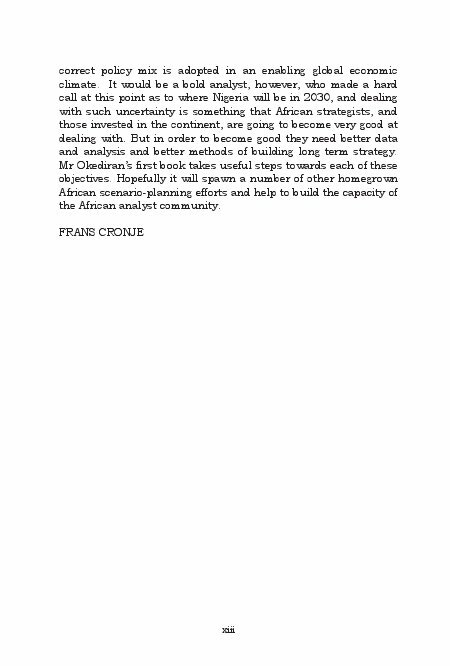 Navigate..., is scenario planning taken on the world's most populous black nation. 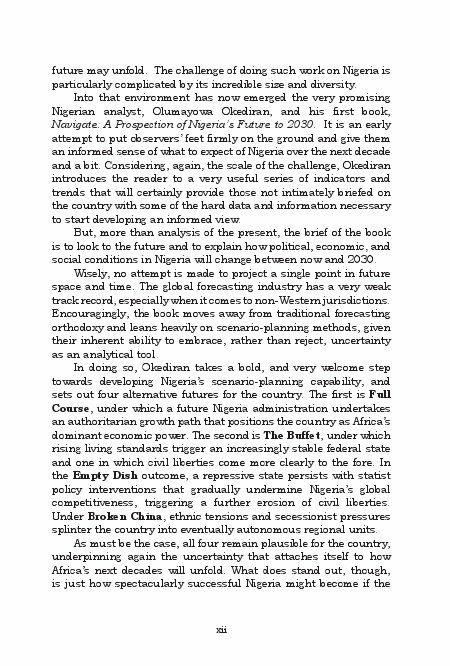 This book is an attempt at presenting a clearer view of how Nigeria's future unfolds from now to 2030. What this book is not is a forecast. Forecast tend to assume the future as a trajectory of the present. Forecasts develop a single certain future around which a strategy must be built. There is not much early warning that the forecast may be wrong. Scenario planning instead understands that there are several possibilities of how the future may play out. Thus, Navigate..., develops multiple plausible futures for Nigeria to 2030. This will help you decide what strategies to build around those futures so that you, your business or your organization are adequately prepared for multiple eventualities. Navigate also includes a tool, that helps you track flags that show which future is playing out, thus helping you as a decision maker adjust your sail. Olumayowa Okediran is the Managing Director of African Liberty, a founding partner at the War Room Associates and the West Africa Policy Fellow at South Africa's top political and economic think-tank, the South African Institute of Race Relations. He also serves as the Assistant Director of International Programs at Students For Liberty. His views on politics and economics have been translated into 16 languages including French, Spanish, Czech, Portuguese, Serbian, Macedonian, Greek, Khmer and Vietnamese and he frequently gives lectures at seminars around the world. Olumayowa completed postgraduate studies in Humanitarian and Refugee Studies at the Unversity of Ibadan and holds professional certification in financial journalism from the Gordon Institute of Business Science and in foresight from the University of Houston.